Sharks BBQ Troy review, pics, hours, and menu info – Sharks BBQ Troy recently opened off Rochester Rd. just south of Long Lake. The chef is Troy resident Louai “Lou” Sharkas who has worked in the food and beverage industry for more than 38 years. Before opening SHARKS BBQ, Lou was the Executive Chef at the Birmingham Country Club. Lou has also served as the Executive Chef at the Townsend Hotel in Birmingham and Zinc Wine Bar renamed to “Red Coat Tavern,” in West Bloomfield. Sharks BBQ is not a sit down restaurant. You order at the counter and there is plenty of seating to enjoy your meal like an authentic southern roadside old-fashioned BBQ joint. You can watch as they slice your meat selection, and then get a glimpse of all the options as you pick your sides. The staff is friendly and take their time helping you out, so it’s not the quickest process. Sharks BBQ menu items can be ordered as a Sandwich, Plate, or by the pound. The items include Angus Brisket, Amish Turkey Breast Beeler’s Pulled Pork, Beeler’s Pork Ribs, Hot Smokey Links, plus the BBQ tasting plate so customer’s can try all of Lou’s BBQ favorites. 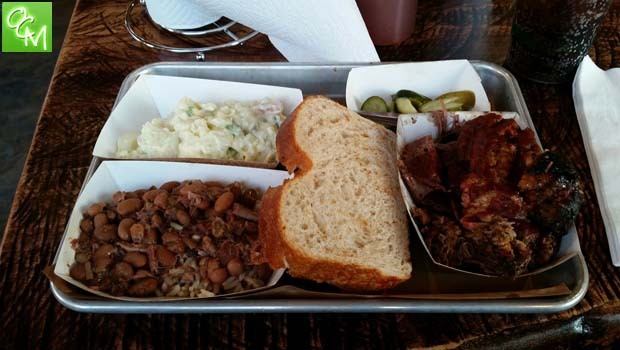 At Sharks BBQ, customers can build their own plates BBQ style. Choose your meat and sides. The Homemade Sides include Citrus Slaw, Creamy Cole Slaw, Potato Salad, Mac & Cheese, Pinto Beans & Rice, Pit Smoked Beans, Potato of the Day, and Seasonal Vegetable. If you decide to go the Sandwich route, the bread is fantastic…homemade in-house and baked fresh every day using traditional ingredients. There are 2 BBQ sauces at the table. One is a Vinegar base and the other is a more traditional style BBQ sauce. SHARKS BBQ prepares the food with a great rub that has the perfect blend of heat (but a tad salty) that sometimes doesn’t really even need any BBQ sauce. Sharks BBQ offers Detroit City Soda, a Michigan made soda. The available flavors are Cola, Orange Cream, Black Cherry, Root Beer, Lemon-Lime. They also offer tea. If you want extremely authentic BBQ, Sharks is a place you should check out. Just don’t expect that the less frills means a more affordable BBQ experience. The BBQ is great quality though. See related posts below for more Oakland County BBQ Restaurants reviews, pics, and info.